If you are looking for a course that embraces the essence of all types of yoga, this is it. This course strongly adheres to individuals seeking their truth as a path for personal transformation. The Yoga aspect of the program involves developing discipline through dynamic yoga practices and rituals to discover a deeper understanding of who you to find your dharma (purpose) in life. Over 108 hours of beautiful videos of yoga classes, lectures and group Q & A. Fascinating charts and illustrations, practical exercises for spiritual development and a multitude of ayurvedic practices and remedies for personal self healing. Comprehensive 300 page course manual. Sun, Moon, Earth: The Sacred Relationship of Yoga & Ayurveda book by Mas Vidal. Yoga DVD series - Masterful practices with Mas Vidal. Sacred yogic prayer bead necklace. Become a yoga and ayurveda counselor at a health resort or spa. Teach yoga at any yoga studio across the USA, fitness centers and health clubs, schools and universities. I love this course! It is filled with rich interesting material and videos. There is so much amazing information there that it is hard to pull myself away. I am so grateful to have met you and to be able to incorporate these teachings into my life and bring it to the world. Thank you for all the valuable lessons and teachings that you have provided for us in this course. It has benefited my life in countless ways and I feel fortunate to have learned from you. Session Five: "Be The Change You Want To See: (Role of the Individual, Noble Qualities, Ethical Guidelines, Doshas in the classroom). Session Seven: SUNSET MEDITATION: (Alternate nostril breathing, sakshi bhava, a witnessing meditation for abundance). Session Two: SEATED / FLOOR POSES (HIPS) - Intro on the sacred seat and floor poses leading towards lotus. Session Three: YOGA POSTURES Continued “Integrating seated postures into a complete yoga practice. Session Four: Review and Q & A of the yoga practice and summarizing seated and floor postures and their importance in yoga. Session One: Sunrise Meditation: (Kapha wake up techniques, Shiva chant, tri breathing technique & silent meditation). Session Two: “Yoga Practice & Dosha Types” Part One: (Discussion on main points of a practice according to Ayurvedic principles). Session Three: A Yoga Practice and Dosha Types: Part Two: (Vata, Pitta & Kapha Practice, 3 distinct mini practices for each dosha). Session Five: LIVING WITH NATURE: ( Ayurvedic Living & Daily Routine, diet, six tastes, gunas & food). Session Six: Living With Nature: (6 tastes & doshas, spices, foods, detoxification, ashrams & applying ancient principles into modern times). Session Seven: SUNSET MEDITATION: (Affirmation, Nadi shodhana and kumbhaka (breath suspension) and light healing visualization). Session Three: MAHA YOGA SADHANA: An integrative group practice sets and techniques according to the seasons. Session Four: Review and Q & A of the yoga practice and summarizing seated and floor postures and techniques. Session Five: Lecture “SPIRIT & NATURE DANCING TOGETHER” Yoga & Ayurveda are One! Session Six: Lecture continued “SPIRIT & NATURE DANCING TOGETHER” Yoga & Ayurveda are One! 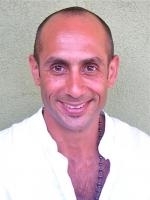 Yogi, mystic, ayurvedic healer and director of Dancing Shiva Yoga and Ayurveda (www.dancingshiva.com) in Hollywood, Ca, Mas is a pioneer teacher and lecturer of Yoga and Ayurveda and is recognized internationally for his work in propagating a unified approach to these sister sciences. His teachings are a dynamic and practical combination of Raja-Bhakti yoga and Ayurveda’s tri-dosha, to create a perfect balance between the physical and the spiritual. His formative training as a Kriyaban disciple of Paramahansa Yogananda teachings eventually led him into the sacred science of Ayurveda and has worked and taught with Vamadeva Shastri (David Frawley) for the last 12 years years and shares his approach and understanding of Yoga, Ayurveda Tantra and Vedanta. He teaches the original Yoga and Ayurveda Lifestyle and Therapy Certification programs internationally and as an Ayurvedic practitioner he maintains an active clinical practice.